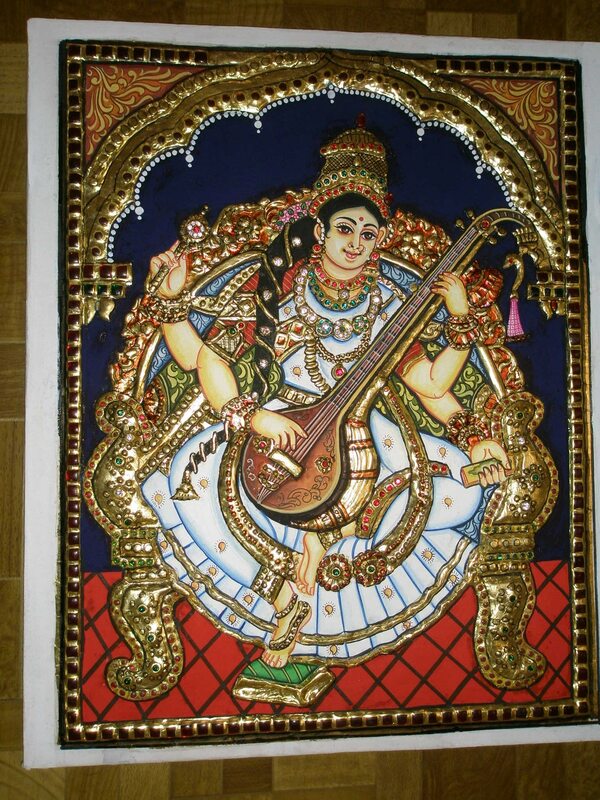 Premlatha tanjore paintings take all type of orders of paintings like goods and goddesses. Radha Krishna (IAST rādhā-kṛṣṇa, Sanskrit राधा कृष्ण) are collectively known within Hinduism as the combination of both the feminine as well as the masculine aspects of God. Krishna is often referred as svayam bhagavan in Vaishnavism theology and Radha is five elemental body of the feeling of love towards the almighty God Shree Krishna, soul (aatma) is a part of the God Shree Krishna and Radha is that feeling of love which connects a living being to his creator. Venkateswara (IAST: Veṅkaṭēśvara), also known as Śrīnivāsa, Bālājī, Veṅkaṭā, and Veṅkaṭācalapati, Govindha is a form of the Hindu god Vishnu. Venkateswara's most prominent shrine is the Tirumala Venkateswara Temple located in Tirupathi, Andhra Pradesh in Southern India.